Cues in the extracellular microenvironment govern the behavior of migrating cells by triggering changes in migration speed or direction. The cell surface receptors that interpret these cues engage cytoplasmic partners to transduce signals, but recent work reveals that many receptors also interact laterally with cell surface proteins that can be critical for proper receptor function. Thus, a more sophisticated understanding of cell migration will require a "cell surface interaction map" describing the physical and functional connections between receptors and their cell surface partners. To begin to build such an interaction map, we have initially focused on integrins, the major receptors for extracellular matrix proteins. Integrins mediate cell adhesion and migration during development, in homeostasis, and in a variety of pathological settings, including tumor cell metastasis. Integrins are heterodimers composed of one α and one β subunit. While both subunits contribute to ligand-binding specificity, the β subunit cytoplasmic tail mediates most of the established integrin signaling and cytoskeletal interactions that have been identified. Thus at present there is no satisfactory explanation for how different integrins that share a common β subunit are able to mediate different cellular responses. 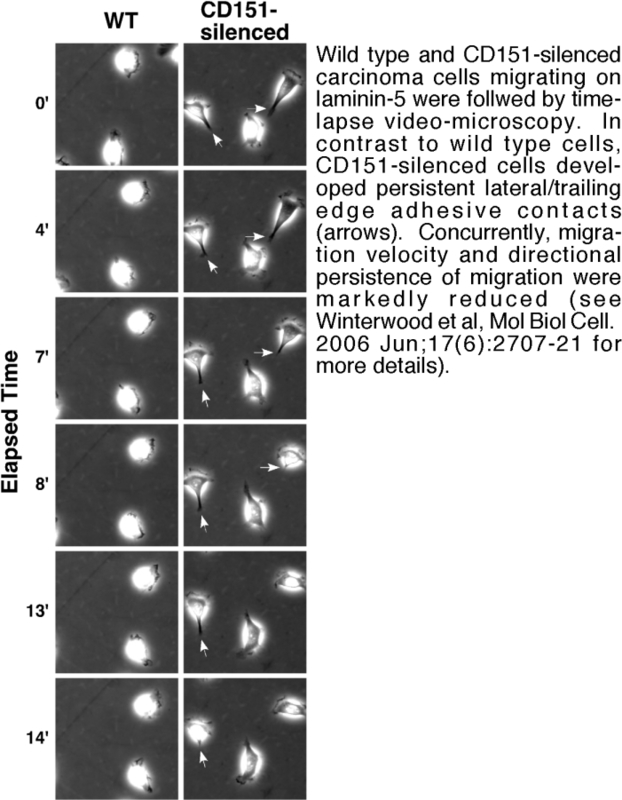 For example, tumor cell motility mediated by α3β1 integrin on its ligand, laminin-332 (laminin-5), can be 3-4 fold faster than motility mediated by other β1 integrins, such as the collagen receptor, α2β1, or the fibronectin receptor, α5β1. 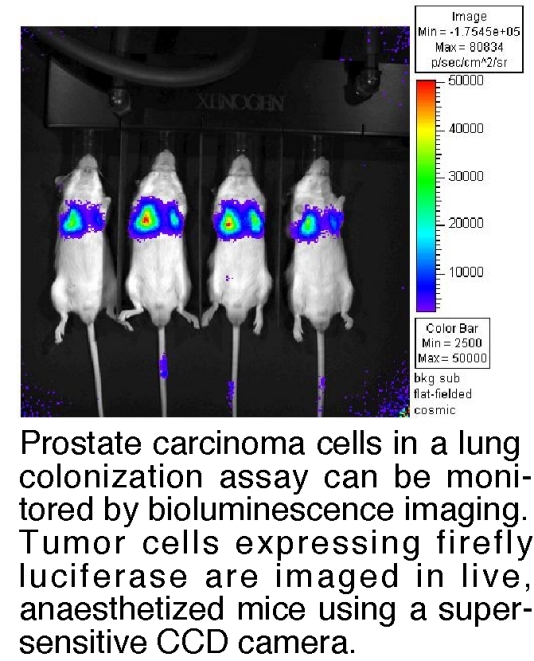 Developing in vivo assays of metastatic colonization using bioluminescence imaging to monitor tumor growth in real time in live animals (see Figure 3). Another form of integrin functional diversity is the ability of individual integrins to mediate different responses in different cell types. For example, integrin α3β1 is implicated in promoting the growth and invasion of some tumor cell types, but in acting as a suppressor in the progression of other tumor types. Here again, α3β1's association with tetraspanins may provide potential answers. 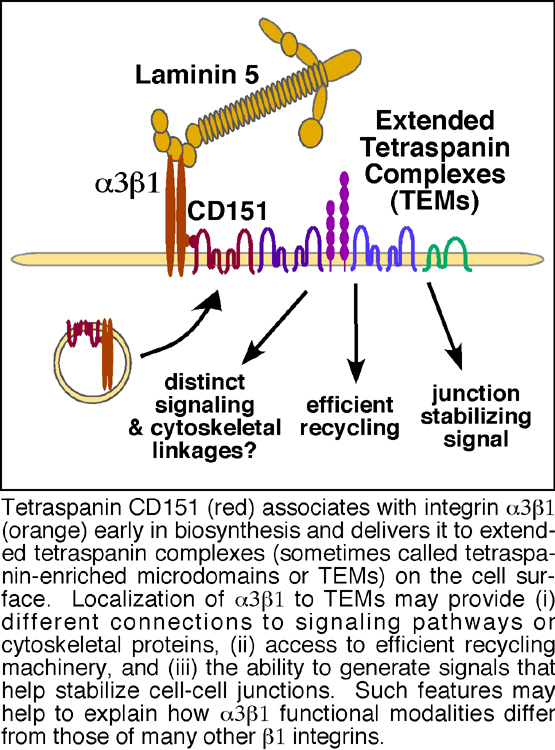 We recently discovered that, in addition to regulating α3β1 integrin's migratory functions (Figure 2), tetraspanin CD151 also contributes to α3β1's ability to promote stable cell-cell junctions in epithelial tumor cells (Figure 4). By mechanisms that we are still unraveling, α3β1 integrin appears to generate signaling that helps to promote stable cell-cell junctions among tumor cells, and this junction-stabilizing function may oppose α3β1’s pro-migratory functions. Therefore, a second major focus in our lab is to determine how tetraspanins regulate the balance between α3β1 integrin's pro- and anti-migratory functions and how this relates to the dual roles of α3β1 in regulating metastasis. A third focus in the lab is the role of integrins and integrin-tetraspanin complexes in neuronal cell behavior. 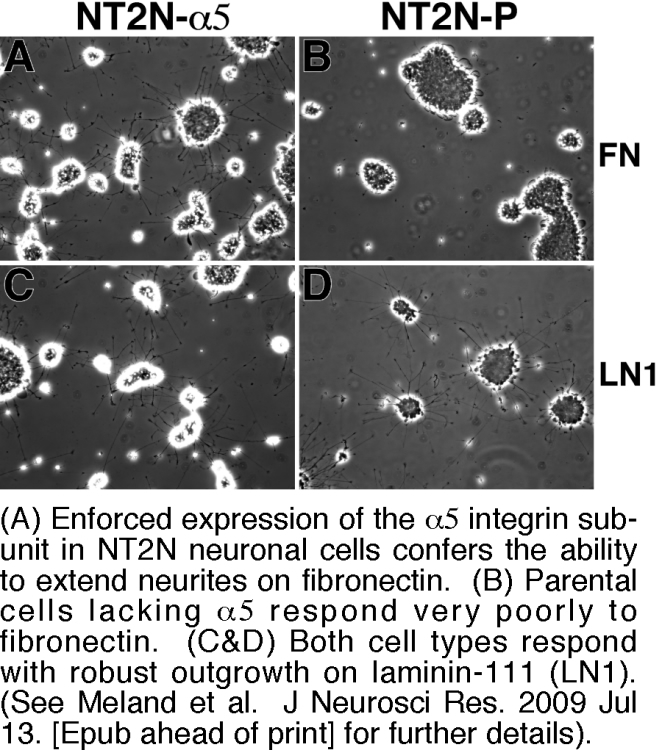 Here, we are exploring the extent to which differing patterns of integrin expression in central versus peripheral neurons may help to explain differences in their respective abilities to regenerate after injury. For example, injured peripheral neurons upregulate α5β1 integrin and may use it to respond to the α5β1 ligand, fibronectin, which also accumulates at injury sites. 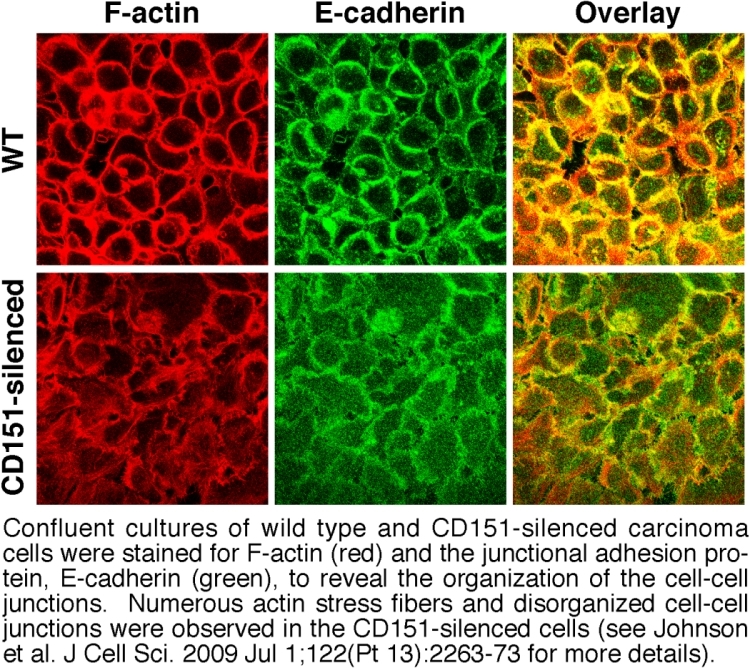 In contrast, central neurons generally express low levels of α5β1 and respond poorly to fibronectin. We recently found that enforced expression of α5β1 can dramatically enhance the ability of a central nervous system neuronal cell type to respond to fibronectin in an in vitro model of regenerative outgrowth (Figure 5). Future directions for this project include evaluating the ability of α5β1 to promote regenerative outgrowth in in vivo models, and exploring how tetraspanins may contribute to the differential sensitivity of outgrowth on different integrin ligands to physiological inhibitors that may be present at injury sites.